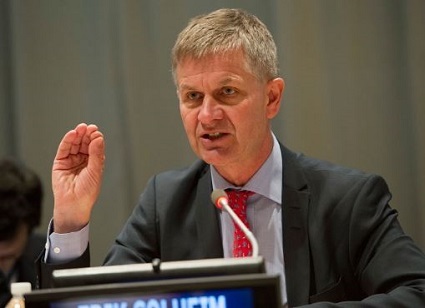 NEW YORK, New York, May 4, 2016 (ENS) – UN Secretary-General Ban Ki-moon has informed the General Assembly of his intention to appoint Erik Solheim of Norway as the new executive director of the United Nations Environment Programme, UNEP. Ban announced his choice for the UN’s top environmental position after consultations with the chairpersons of the regional groups of UN Member States. Solheim is currently chair of the Development Assistance Committee of the Organization for Economic Cooperation and Development, OECD, a post he has held since 2013. Solheim is a Norwegian politician for the Socialist Left Party. From 2007 to 2012, he was Norway’s Minister for the Environment and International Development and simultaneously Minister of the Environment. He served as Norway’s Minister for International Development from 2005 to 2007. Solheim went to high school at Oslo Cathedral School and after serving conscription for the Norwegian Air Force in Bodø (1974–75) he graduated from the University of Oslo in 1980 after studying history, sociology and political science. After 11 years in parliament he worked for five years for the Norwegian Ministry of Foreign Affairs before being appointed minister. Achim Steiner, UNEP’s outgoing executive director welcomed the secretary-general’s announcement. 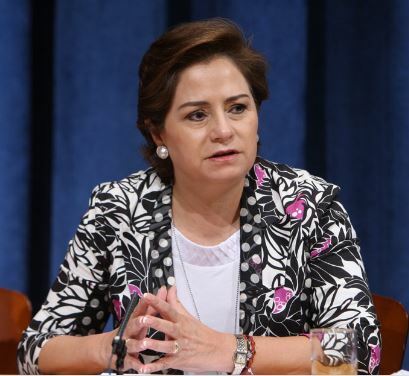 The secretary-general has also announced his intention to appoint Patricia Espinosa Cantellano of Mexico as Executive Secretary of the United Nations Framework Convention on Climate Change (UNFCCC), replacing Costa Rican diplomat Christiana Figueres. Espinosa Cantellano has more than 30 years of experience at the highest levels in international relations, specializing in climate change, global governance, sustainable development and protection of human rights. She is also a former ambassador to Austria, Germany, Slovenia and Slovakia and served as secretary of foreign affairs in the cabinet of President Felipe Calderón. She graduated with a bachelor’s degree in International Relations from El Colegio de México and earned a diploma in International Law at the Graduate Institute of International and Development Studies in Switzerland.